Banish those flabby upper arms for good with this 10-minute workout. These arm-strengthening exercises tone your triceps, the muscle above your elbow. Before you begin, get limber with a 6-minute warm-up routine. Afterwards, cool down with a 5-minute stretch. Place your hands underneath your shoulders with your arms fully extended, palms flat and fingers facing forward. Legs are straight and knees are off the floor. Your body should form a rigid plank from head to toe. Lower yourself by bending your elbows out to the sides until your chest is about 2 inches above the floor. Push back up and repeat 10 to 15 times. Don't let your hips sink as you lower yourself. Avoid arching your upper back when pushing back up. For an easier version, perform the press-up with your knees on the floor. Stand at arm's length (or further for more difficulty) from a wall. Place your hands on the wall at chest height and shoulder-width apart or closer. A closer grip will work your triceps harder. With elbows tucked in, bend your arms to lower your body towards the wall. Let your heels come off the floor as you lean in to the wall to keep your body straight. Push back up and repeat 10 to 15 times. Your body should form a rigid plank from head to toe during the exercise. For more of a challenge, perform the exercise with your hands on a stable chair or on the floor. Sit on a stable chair with your hands gripping the edges either side of you. Inch your feet forwards to lift your bottom off the chair. Keep your knees hip-width apart and bent at 90 degrees. Lower yourself by bending your arms to about 90 degrees, keeping your elbows tucked in. Push back up and repeat 10 to 15 times. Don't thrust your hips up as you push back up. 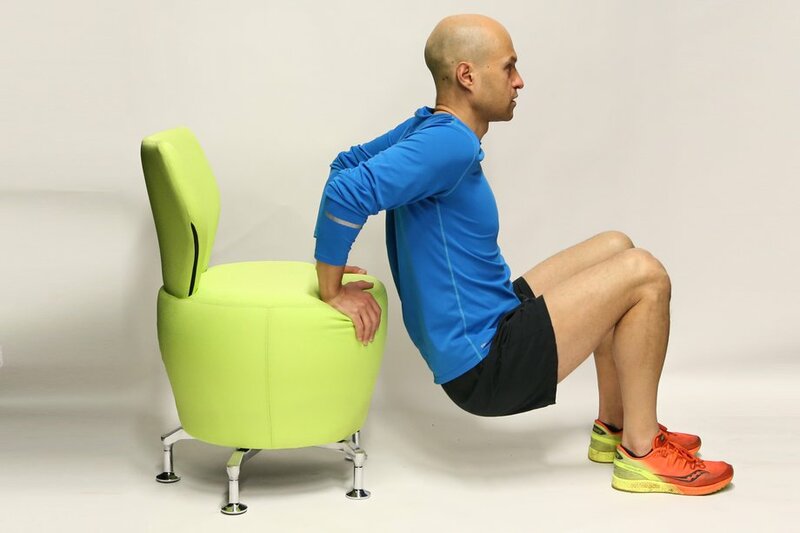 To make it easier, do the dips without the chair, with your hands on the floor. For more of a challenge, perform bench dips with straight legs. Kneel down on your right knee and lean forwards. Raise your elbow behind you, keeping the arm bent at about 90 degrees. Straighten your left elbow to raise your arm behind you as far as feels comfortable. Bend your elbow to return to the starting position and repeat 10 to 15 times. Then, switch knees and perform the exercise with the other arm. The elbow performing the kickback should stay raised during the exercise. For more of a challenge, perform the kickback holding a weight (such as a dumbbell or a bottle of water).